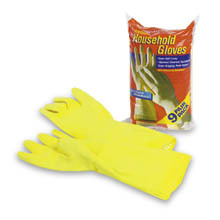 Durable and long lasting household gloves. These are for everything you can think of using a glove for around the house or for the Kitchen in any restaurant. The clean ones have a soft inner lining to avoid hand irritation and the are easy slip-on and off gloves. Choose your size below. Durable long lasting disposable Polyethylene glove with a textured grip, this glove is stronger than the average plastic glove also easy to slip on. Color: Clear, Case Total 2,000 Gloves.